An inclusive workplace requires a few changes. However, the benefits from disability and workforce modifications are worth it. MatchWorks is here to assist employers in preparing to welcome and retain an employee with a disability. 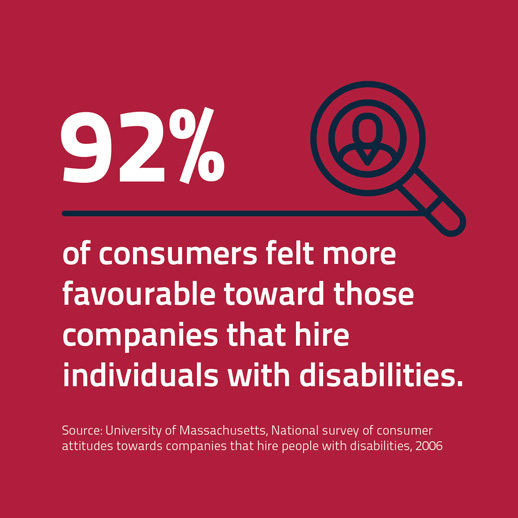 Contact us to discuss how to make your workplace accessible for everyone. The first step in the process for disability and workforce modifications is to audit your workplace to ensure it is accessible for people with a disability. Most newer buildings should comply with the Disability Discrimination Act’s minimum accessibility requirements. However, older premises may need updating. MatchWorks supports employers to introduce assistive and adaptive technologies to improve communication, mobility and productivity in the workplace. Adapt existing equipment to suit the needs of an employee with a disability. Acquire new software or equipment to help your employee complete their job tasks with better ease and/or independence. To with us about available funding to support this equipment for eligible staff. Review current workplace policies and procedures. An employee with a disability may need flexible working arrangements. Amend position roles to transfer minor duties not central to the job which a person with a disability may find hard to perform. Train staff in disability and mental health awareness to increase their knowledge and understanding of people with a disability. If you have an employee whose illness, disability or medical condition is impacting their performance at work, MatchWorks may be able to assist you to support your employee in their current position. Job in Jeopardy is a no-charge service. Your employee doesn’t need to receive Department of Human Services payments or have an Employment Services Assessment.